We’re obsessed with solving all the challenges you face at work during your day-to-day. It’s our mission to create a product that’s simple, beautiful and easy-to-use — one that you’ll actually enjoy using. 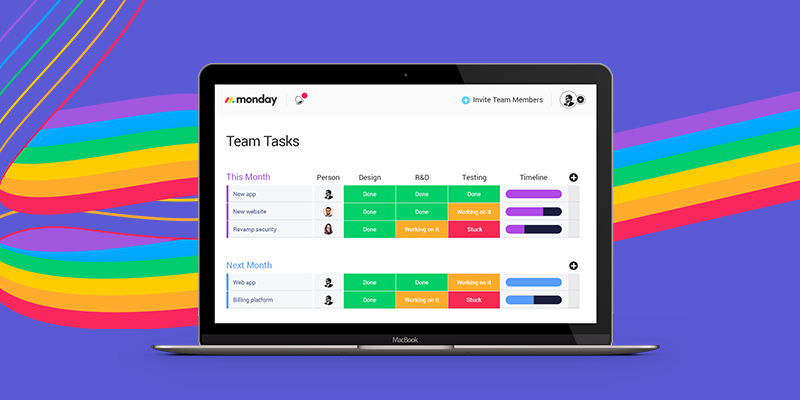 With that in mind, here are 10 new features and improvements we’ve added to monday recently. We hope they make your workday way easier! We say that project management is better when it’s visual, and things just got way more so with the release of 20 beautiful status colors. There’s also a new and improved edit mode for your status menu to reduce clutter. Go ahead — customize your labels and build that Barbie board of your dreams. Power to the people! Two-factor authentication offers an additional layer of security for your account. Any time someone on your team logs in from an unfamiliar device, they’ll need to first confirm a code that’s texted to their phone before they can continue. Once only available to Enterprise plans, we’ve opened 2FA to all plans at no extra charge. It’s a layer of security we think everyone deserves. Tags work like keywords or labels to organize your tasks, to-dos, and projects across all boards. Just click on a tag to get a filtered cross-board view of everything you’ve tagged. You can also filter by tag within a single board. Learn more about how you can use tags. 5. New limited board permissions mode. For when trust only goes so far. Building the perfect board for your workflow is a beautiful thing — so, you don’t want anyone to mess it up. Introducing “Edit content” permissions mode, where your teammates are free to change and edit pulses only. This gives you all the benefits of collaboration without fear that someone will make major structural changes to your board. Say goodbye to scrolling and dragging — you can now create a new column just to the right of an existing one with a single click. The same goes for adding a pulse below the one you’re working on. After all, sometimes it’s the little things, and we think this should make a big difference. In addition to mentioning specific people and teams, you can now mention everyone who’s subscribed to a board. On a shareable board, you can mention all your guests at once. This is a quick and easy way to communicate with the people you’re working with. Just hit @ and give it a go. Have lots of pulses and can’t find what you’re looking for? We’ve created a new shortcut to make your life easier. Just press command or control + F, start typing, and voila. You’re right there in the Search/Advanced Filter field of your board. We heart shortcuts. Planning for the future? We just made it a lot more convenient. You can now choose the year in the date and timeline column with a single click…rather than having to click 36 times to set a date 4 years from now. Hallelujah. Did you know we have a desktop app? We do! And it’s better than ever. We made speed improvements and fixed some nagging bugs. Get it now for Mac or Windows. Stay tuned for even more great improvements to come!